I love shoes! The more feminine the better. I am actually proud of the number of shoes in my closet - many. Although age has stated to limit the height of the heel, I still can walk and move very comfortably in 3” heels. My mother would be proud – I think? Because my love for shoes did not just come from within me. My mother had beautiful shoes. In our small town, there was not an abundance of shops and we did not have a shopping center/mall. However, there was a shoe store downtown and my mother's best friend was the owner. No trip to town went without a stop at the “Shoe Store”. I can still remember the wonderful smell of the high-end leather. The shoes were not kept in the back room, but the walls were lined floor-to-ceiling with shoe boxes. I would watch as my mother tried on the delightful creations and occasionally would buy a pair. 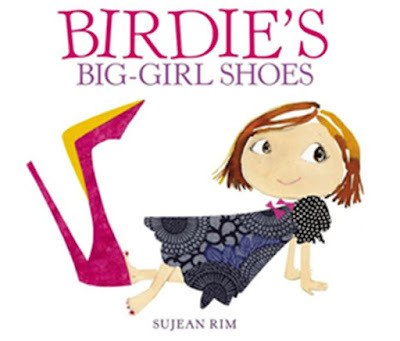 I recently purchased a delightful children’s book entitled “Birdie's Big-Girl Shoes” written and illustrated by Sujean Rim. It is adorable. Amazon described it this way. Someone asked once – "And where did you learn to walk so well in heels? " I just smiled and knew my mother would be proud. Cinderella got the prince and Dorothy was envied. Why? They had fabulous shoes. So was I the only one that played with their mother’s shoes?